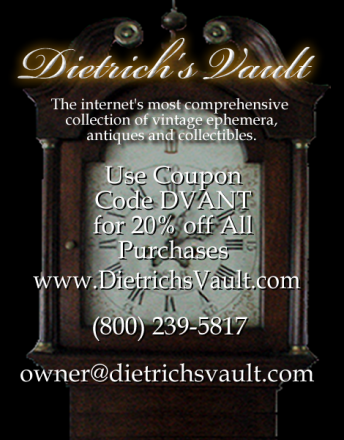 The internet’s most comprehensive collection of vintage ephemera, antiques and collectibles. Featured items include 19th and 20th century magazines and newspapers such as Civil War Harper’s Weekly and Frank Leslie’s. A few of the illustrators represented are Winslow Homer, A. B. Frost, Norman Rockwell, Howard Pyle, Maxfield Parrish, N. C. Wyeth, Thomas Nast and Jessie Wilcox Smith. Completing the collection are classic portraits, prints, rare books, Native American artifacts, antique lighting, early advertising, and period furniture.